The Harvestworks New Works is pleased to announce our 2019 recipients. The recipients are commissioned to create a new work in the Harvestworks TEAM (Technology, Engineering, Art and Music) Lab. The applications were reviewed by New Media Artist Thessia Machado, Director of Technology at Pioneer Works Thomas Martinez, New Media Artist Jakob Dwight and moderated by Carol Parkinson, Executive Director, Harvestworks. The Language of the Angels is an immersive virtual reality artwork that playfully addresses the changing conception of space and place within our own consciousness. The work consists of an obsessively detailed model of Mollye’s bedroom, drawing tension between technology and consciousness to represent the realities we construct. Each week, a new “chapter” of the room is released, allowing viewers to manipulate the space and create alternative realities. The Language of the Angels will be released on a dedicated website each week. Mollye Bendell makes digital and analog sculptures for digital and analog worlds. 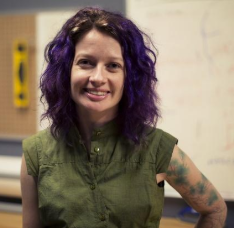 Her practice explores the dissolving line between the digital and the physical that defines the human/user experience of “things.” In her work, she experiments with virtual reality, 3D printing, laser cutting, CNC machining, circuit building and bending, and codeable objects. The intangible nature of electronic media is used as a metaphor for exploring vulnerability, visibility, and longing in a world that can feel isolating. Mollye currently lives and works in Baltimore, Maryland. Luciferins is an interactive environment of hanging fiber structures inspired by the bioluminescent fish and the plethora of invisible network traffic that surrounds us. These structures enshroud delicate custom systems that become alive with moments of light, sound, and animation as viewers approach them. Within the artwork’s environment is a communication portal that opens and shows local network traffic that is invisibly flowing and traversing throughout the space. This gives viewers a sense of the unseen activity that surrounds them—just as a swimmer would make a dwelling of sea sparkle appear by swimming through it. The piece allows for an alternative experience of abstract concepts concerning technology; enabling viewers to connect it to their everyday lives. Katherine Bennett is a media artist who utilizes sound and light to represent people, relationships and activities that happen in other spaces and times. She creates a delicate presence of these entities, mapping it over time and making it visceral by using programming and physical computing to create interactive and responsive multi-channel installations and narratives. Katherine earned her MFA from The School of the Art Institute of Chicago in the Art & Technology Studies and Sound Department. Sound artist and instrument builder Ranjit Bhatnagar will be working with pianist Kathleen Supové and violinist Patti Kilroy to develop Force Feedback, an installation and performance that explores the relationships between creative and physical effort, difficulty, and energy. These connections between creative force and physical force allow performers to give abstract energy to the audience, and Force Feedback will go farther by creating an environment that transforms the performer’s exceptional physical work into new forms of energy, such as light, heat, and mechanical motion. 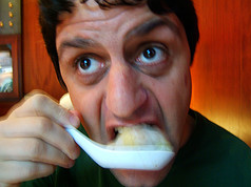 Ranjit Bhatnagar works in music, installation, and text, with a particular interest in algorithmic techniques and in improvisation at all stages of creation. His works have been exhibited across the United States and in Europe. 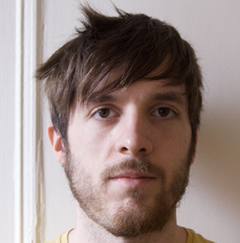 He has performed recently with Lea Bertucci, Qubit and Margaret Leng Tan, and recently published a book of algorithmic poetry, “Encomials: Sonnets from Pentametron”. Kathleen Supové is one of America’s most acclaimed and versatile contemporary music pianists. 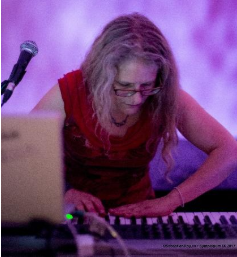 Ms. Supové annually presents a series of solo concerts entitled The Exploding Piano, a multimedia experience using electronics, theatrical elements, vocal rants, staging, and collaboration with artists from other disciplines. Through her composer collaborations, she has become an integral part of creating a repertory of piano pieces for the modern world. Patti Kilroy is a violinist that has played with groups like Wavefield Ensemble, Alarm Will Sound, Newspeak, metal string quartet seven)suns, Ensemble Signal, indie band OWEL, and the Wordless Music Orchestra in places like Carnegie Hall and the Sydney Opera House. She teaches violin at Western Connecticut State University and NYU and is a candidate for the Ph.D. in Violin Performance at NYU Steinhardt. 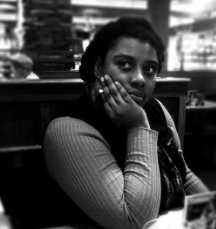 Zeelie Brown will be developing an immersive light and sound installation that explores the archive of Audre Lorde, examining the crossroads of environmental peril, digitally inspired social change, and a politics of fear. This environment will represent both sanctuary and wilderness, acting as a refuge amidst social and political flames. Within the installation will be a performance that interrogates predetermination, with some features scored and others relying on the audience. Zeelie Brown is an interdisciplinary artist whose spiritual work conjures together Afro-Atlantic religious cultures to form Soulscapes–black, transfeminine, utopic, technopolitical sanctuaries. By utilizing sound, textiles, and installation, her practice manifests revolutionary beauty to offer spaces of anti-patriarchal gentleness, light, and warmth. Zeelie has performed at RISD, Flux Factory, Elsewhere, Recess Gallery, Project Row Houses and Harvard University, and has been featured in Art in America and the Village Voice. 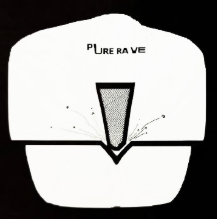 Pure Rave, a collective based in Detroit, Michigan, is an ongoing experiment in “chance dance”. Set amidst the context of contemporary Detroit electronic music, rhythmic sonic collage is created from various prepared turntables, “damaged” records, drums machines, and 133.33 bpm loops. At Harvestworks they will take their self-proclaimed “old-world indeterminate” production style to another level and create a program that bridges experimental DJ performance style and electronic music composition. Core members Nick George and Bryan Dulaney expand on techniques developed by experimentalists Christian Marclay, Pierre Schaeffer, Otomo Yoshihide, Maria Chavez, Qbert, and Graham Dunning, approaching the Pure Rave project as a set of rules and limitations for an inaccessible academic experimental music scene and vapid modern DJ culture. AntiBodies is a set of video game simulations about the ways video games and other forms of virtual reality represent (and misrepresent) the female body, creating a world where body dysmorphia is an artificial intelligence that decides how bodies move and collide. The avatars in AntiBodies are all Frankenstein-like ready-mades concocted from a vast library of modular assets shared and created by the video game community. By using these “assets,” Sabine is exposing the surreal misogyny and racism that is programmed into the software and embedded in video game technology itself. Sabine Gruffat is an artist who works with experimental video and animation, media-enhanced performance, participatory public art, and immersive installation. By actively disrupting both current and outmoded technology, she questions standardized ways of understanding the world around us. She is also a filmmaker with a special interest in the social and political implications of media and technology, creating films that seek to empower people, encourage social participation, and inspire political engagement. 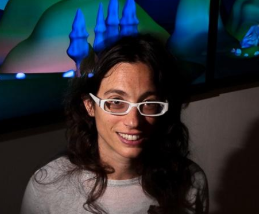 Currently she is Associate Professor of Art at the University of North Carolina – Chapel Hill and a co-founder of the Cosmic Rays Film Festival. 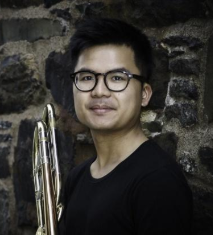 Kalun Leung will develop a methodology for movement-based electroacoustic improvisation for the MuBone Augmented Trombone. The Mubone is a new, proprietary hybrid instrument created by Kalun outfitted with orientation sensors, tactile controls, and integrated loudspeakers. The Max patch environment 3D Granular Synthesis (3DGS) works in tandem with the MuBone, tracking any movements via an instrument-mounted sensor and enables the performer to control live processing. Kalun Leung is a trombonist, improvisor, composer and creative technologist based in Brooklyn, New York. His work as an instrumentalist is motivated by the exploration of new and unexpected contexts in which the trombone can thrive. This ongoing research-based approach has manifested in audiovisual performances of Keith Haring’s unpublished computer art and a Fluxusinspired trombone sound sculpture. He is a member of the movement and sound improvisation collective ECHOensemble, Eco-Music Big Band, and has a solo project involving electroacoustic improvisation. Audio Chandelier: Mappings is a multi-channel point source audio piece for performance and installation that builds on Naphtali’s prior work. Shimmering motions and reverberant spaces will be created using one or two audio sources with MIDI and Max/MSP controlling the parameters. 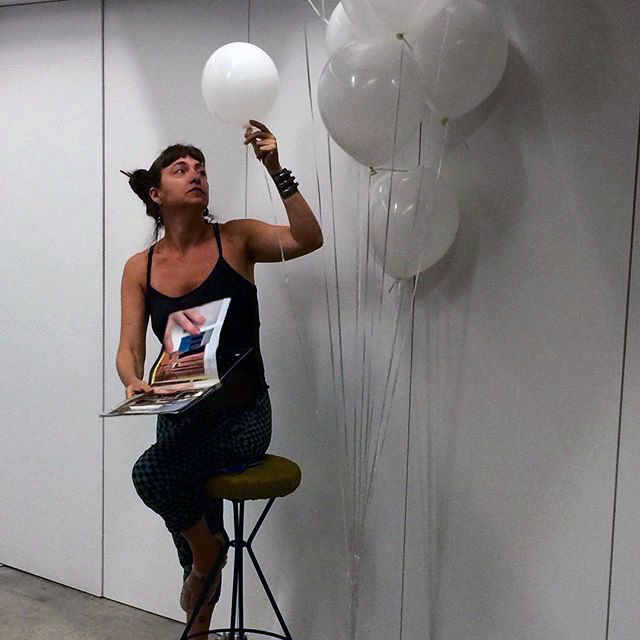 Improbable, Inevitable is a series that includes performance, installation, print, and digital painting. It reflects on the connection between technology and nature, and focuses on algorithms that give us access to the growth patterns of nature. The series aims to provide a space of thinking about computation and art, the differences in speed when comparing digital to natural processes, the role of the artist in the age of machine-based artworks, and the relationship between speed and consciousness. Matthew Ortega is an artist, designer and musician working at the intersection of art and technology. Beyond the use of traditional media such as cut and torn paper, he also worked with video and sound by using archival film and youtube clips to create fictional narratives. After a brief hiatus working as a digital designer, he acquired the skills to start creating custom software to further expand his artistic expression. Though he still works with ideas of refuse, decay, and distortion that come from remix culture, he also began to explore what technology can offer to one’s art practice. Manifesto from Lorraine is a sculpture consisting of a loudspeaker made out of glass mounted on a tripod. The glass speaker tilts and nods while speaking out extracts of manifests and texts of different subjects and authors. Texts will be inspired by the authors Les Commissaires Anonymes, a “Manifesto about the Art of Living at All Costs, dedicated to the artist Robert Filliou and to all of us, talentless geniuses here and now.” The sculpture’s formal aesthetics are it’s unique glass design and it’s physical attitudes and movements. The sculpture’s substantive elements are the sounds emanating from it, with a flow manifestos read out loud. Zahra Poonawala was born in Geneva, Switzerland in 1983. She lives in New York and studied art in France with a degree from Haute Ecole des Arts du Rhin (Hear, Strasbourg) followed by New Media at the Fresnoy, Contemporary Art Studio. She collaborates regularly with composers, programmers, constructors and interprets. The START Magazine Archive Project is an immersive installation that integrates videos, sound, objects, and reproductions of personal archival material. Beginning with research on Yugoslavia’s START magazine of the 70’s and 80’s, the project develops moving image works with the photographs, texts and illustrations found in the publication. Music is composed by the American/Slovenian composer and arranger Igor Lumpert using different styles and singing techniques where vocalists sing fragments and phrases in overlapping, rhythmic precision patterns. The work examines nostalgia for the past which is often mixed with the utopian memory of a socialist society, where the selling of this unique historical place becomes an allegory for the true and final end of Yugoslavia. On a deeper level it exposes the conflict in society of post Yugoslav republics confronted with huge questions of identity while still standing between two different ideologies. 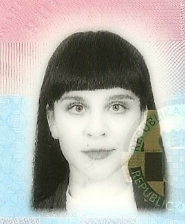 Željka Blakšic AKA Gita Blak born in Zagreb, Croatia (ex- Yugoslavia) is a multidisciplinary artist who lives and works in New York City. Her inspiration often stems from the sub-culture of the 1990s-era in Croatia, when punk, anarcho and eco movements were having a renewal. Her artistic career began in early adolescence in the field of music and performance. The current work reflects long-term collaborations with different subculture groups, collectives or choirs often placed in non- traditional architectural spaces. She works across multiple disciplines; the constants in her practice are performance, 16mm film, video and installation. Nicole will create an audiobook project based on a book of poems she has written entitled “Ain’t I a Woman (?/! ): Poems.” The process for the audiobook is basically creating an experimental piece that derives from her collection of poetry based on the experiences of Black women as well as her observations on her own experiences being a large, Black woman in American society. The TEAM lab will be used to record her voice while she recites her poems, utilizing different effects to transform each piece into its own individual work of art. After the project is complete she plans on touring the project with her performance work as well as distributing it on her Soundcloud page. She also plans on some live performances of the work as well. Nicole Goodwin is the author of Warcries, as well as the 2018-2019 Franklin Furnace Fund Recipient, the 2018 Ragdale Alice Judson Hayes Fellowship Recipient, 2017 EMERGENYC Hemispheric Institute Fellow as well as the 2013- 2014 Queer Art Mentorship Queer Art Literary Fellow. She published the articles “Talking with My Daughter…” and “Why is this Happening in Your Life…” in the New York Times’ parenting blog Motherlode. Additionally, her work ‘”Desert Flowers” was shortlisted and selected for performance by the Women’s Playwriting International Conference in Cape Town, South Africa. Lumen is a modular, 8-channel interactive light/sound sculpture exploring intimacy in interactivity. Glowing acrylic globes backed with mid-range woofers and an optical theremin circuit extend sonically and physically into the listeners’ space and shift in pitch and brightness based on the listener’s nearness to the objects. The globes become proximity responsive sensors that reach out and break down hegemonies of art object and audience. Lumen engages immersive audio & sonic spatialization initiatives and functions as a spatial instrument. The project will be presented as a suspended 8-channel sound sculpture, illuminated in a dark room. As listeners approach the globes, affecting the amount of light hitting the sensor, the pitch of each globe will shift. With multiple people in the room, the pitches of the different globes will evolve into a larger room composition. 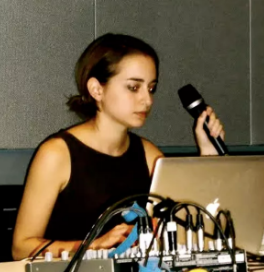 Jenn Grossman is a sound/experiential media artist/composer concerned with the psycho-spatial possibilities of ephemeral media, exploring displaced realities, staged synchronicity, cyclical time, memory, disembodiment, and perceptual affect as components of composition. Her work has taken the form of modular sound sculptures/installations, multichannel sound works, light/projection events, ambient soundscapes, video projection installations, and public interventions. An Acoustic Story on Climate Change: Himalayan Glacier Soundscapes will be a 3D spatialized sound composition. The composition will use sounds from field data in the Himalayas and the Ganges, musical sounds that Ibarra has created as a soundpack (with Splice), and some live recording. She is also interested in making the 3D space interactive for the audience. 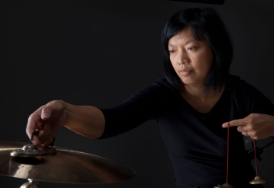 Susie Ibarra is a composer, percussionist and sound artist based in New Paltz, New York. She is a Yamaha, Paiste and Vic Firth Drum Artist. Ibarra is a 2018 Asian Cultural Council Fellow in support of her project, Himalayan Glacier Soundscapes, An Acoustic Story on Climate Change. She is mapping and researching sound data from source to sink along the Himalayas into the Ganges with glaciologist and geomorphologist Michele Koppes. The project is an Immersive Audio/ Virtual Reality Experience that will envision the landscape and residue left after the demise of human species. The sky color and weather as well as the ambient soundtrack will be created by the brainwaves of the user in real time using an EEG Arduino brain wave visualizer. Landscapes will be created from faux fur, foam and miniature models. Images of these landscapes will enter into the virtual world by mapping them onto the mesh created in a 3D game engine. The project will collapse two reenactments: popular news media of landscape in climate crisis, and the artist’s own memories of landscapes. 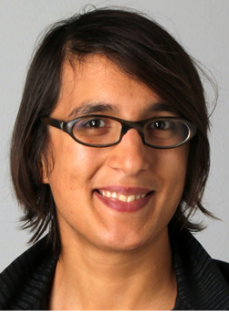 Sarada Rauch is an artist, poet and musician born in Los Angeles and based in Brooklyn. Rauch’s work reenacts popular media and intimate memory, collapsing them into each other to explore the construction of histories and unbelonging. She works primarily in digital and new media with a practice that includes sculpture, writing, and performance.